Continuing north on Highway 1 we arrived at the Russian Gulch Bridge (10 0151). 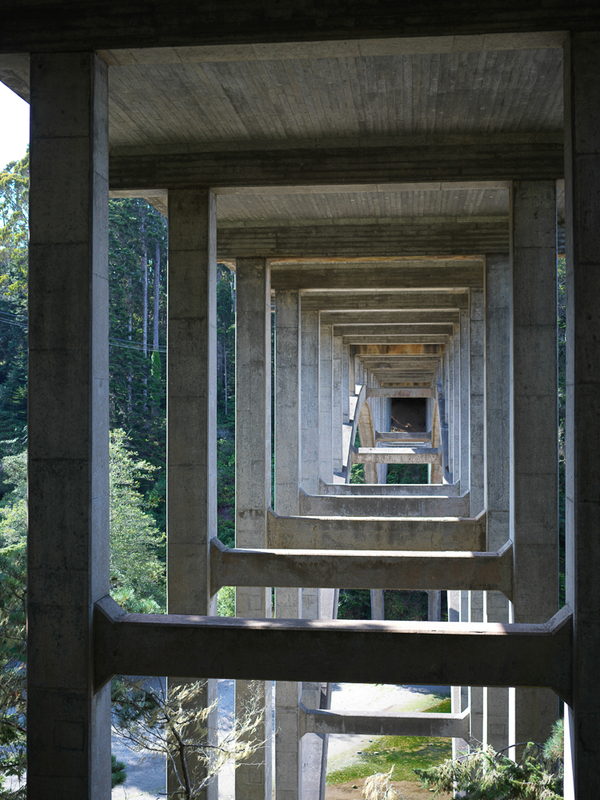 This structure, built in 1940, is a well-regarded bridge with it's own Wikipedia page. 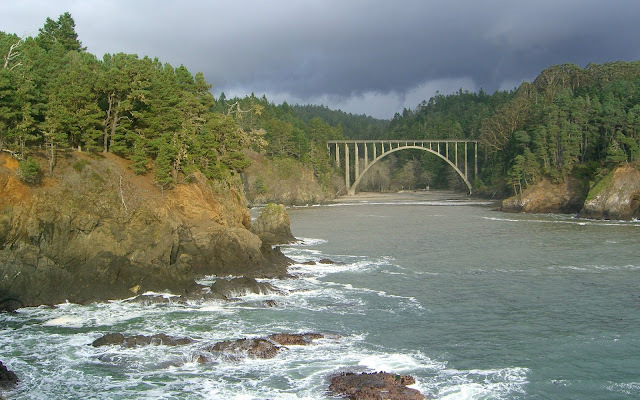 Even more remarkably, it was renamed in 1974 after a Caltrans' bridge engineer (the Frederick W. Panhorst Bridge) although the bridge was actually designed by his subordinate Henry E. Kuphal. I stood as far back as I could along the narrow beach to shoot the top two photos. Jason Hollinger got an even better photo by going out to the headlands and turning back towards the shore. 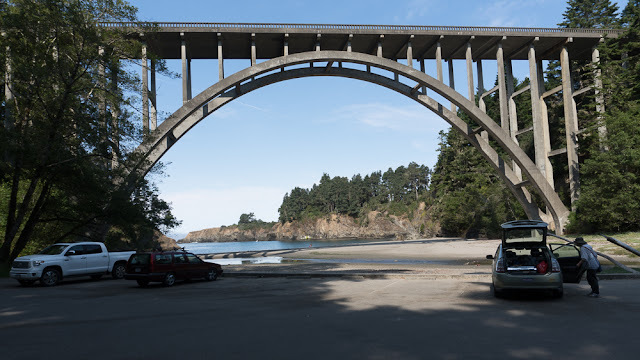 Caltrans bridge engineer Arthur Elliott (1911 - 2004), wrote that the bridge's appearance was improved by providing wider spaces between the taller spandrel columns and narrower spaces between the shorter columns (with a reference to ancient Greek architecture). That's too subtle a feature for me to appreciate. However, I do like the shape of the arch. 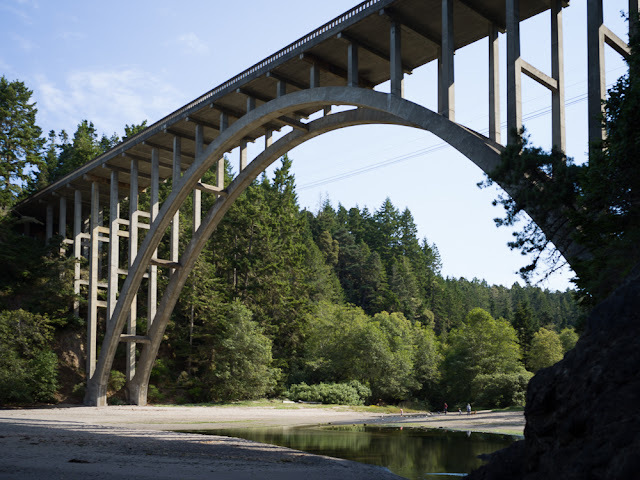 The Russian Gulch Bridge is a reinforced concrete open spandrel arch structure that is 527 ft long and has a 240 ft long arch span. 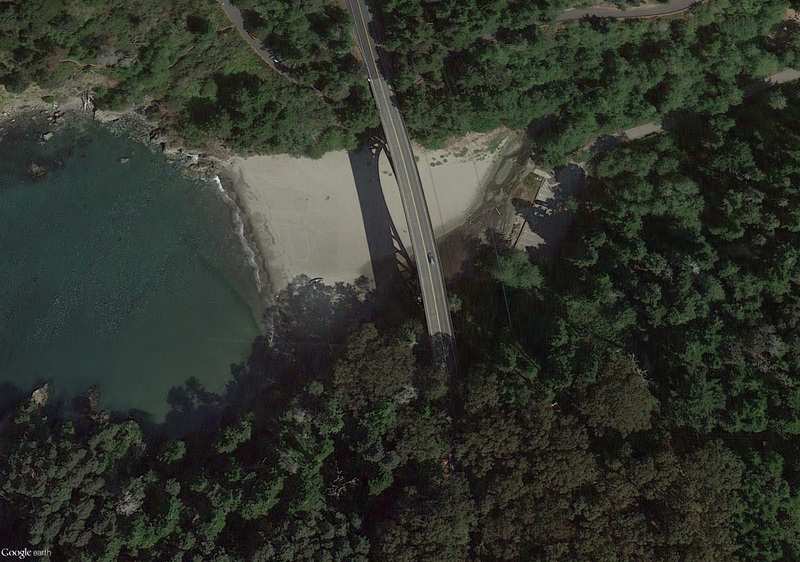 There were hundreds of this type of arch bridge built in California during the first half of the 20th century, especially along the coast. They were the preferred method of stepping over a moderate obstacle. Today, this narrow beach might be crossed by a prestressed concrete box girder bridge or by a more streamlined arch structure.